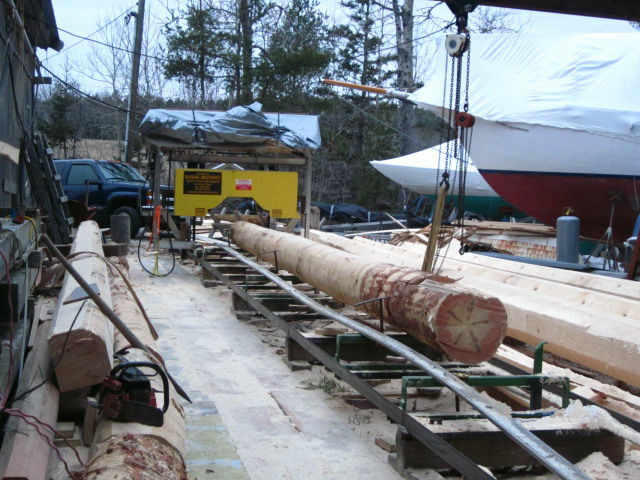 Built with a grant won from the Maine Institute, our unique saw mill was concieved by Elk Spar & Boat Shop and in 2008 was built by Marine Machines from Bar Harbor, ME. The saw is equipped with an articulating head and a control box that allows the operator to tilt the blade and head up or down as needed to cut along a curved line. This allows cutting tapers in spars up to 90' in one pass with considerable time savings. We can shape the spar into a tapered square and cut the 8's before a hand tool touches the wood. Our mill is the latest tool in the quest for spar building nirvana; resulting from hours of swinging an adz, pushing a skilsaw or a Linear Link, all the while thinking, "there must be a better way." We found it.